Your wedding day is probably the most important day of your life outside of the birth of your children. So many things can go wrong. Do not let your wedding dress be a concern on your special day. We have altered, cleaned and preserved hundreds of gowns. Alterations – Our seamstresses have not only altered but actually tailored dresses from raw material. So they know the structure of these elegant gowns. This allows them to alter your dress just the way you desire. From fitting you perfectly and comfortable to having the train just the right length. 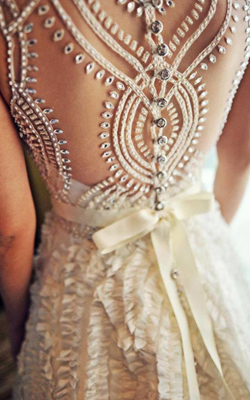 San Diego Dry Cleaners prides itself on the attention to detail of your special dress. 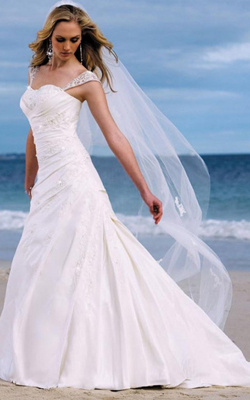 Cleaning – We use clean, distilled solvent every time we clean a wedding gown. This ensures it gets or stays bright without becoming dingy. We never clean it with other items or garments. In a delicate, short drying cycle guarantees that the gown is not agitated too much. Wedding dresses go through some obstacles throughout your special day. From pictures, to the ceremony to the reception the dress will get some stains on it. We always pre-treat those tough stains to make certain they are removed as best as possible. The worst thing you can do is let the stains and dirt set. Time and heat are the worst things for your dress. So whether it’s with San Diego Dry Cleaners or another company, please clean your dress ASAP to allow the fresh stains to be removed easier. Pressing – When you get your dress most likely there are wrinkles and creases from trying it on to possibly having it shipped to you or the store you purchased it from. Let San Diego Dry Cleaners press those wrinkles out before the wedding. We have a pristine facility that will keep your gown spotless during the pressing process. Need your dress pressed day before or even day of? No problem, you just soak up the moment and let us take care of it for you. Preservation – So the wedding was unbelievable and your honeymoon was true bliss. Give us a call and we will pick-up your dress, clean it, preserve it and drop it back off to you. The sooner you clean your dress the better the dress will be cleaned. We will clean your dress with our careful and advanced process. Then we will preserve your gown in an elegant, acid free, sealed preservation box. There is a viewing window to see your beautiful gown whenever you want to relive that special day. Please call our Wedding Gown department for any questions you may have. 858-226-6311.